Hello everybody and welcome to the first ever Henhouse video tutorial. I know crazy, right? I’m not super good at these sorts of things so please let me know if I am missing any vital information. In the below vid you will see the looping method that is key to weaving a macrame chair. I tried to make the pics as thorough as possible so you would get the trick. Here are a few other vital tips. Pick up a macrame tutorial book from ebay or etsy. They don’t make them anymore and this is probably the easiest place to find them. What’s that you say? “Where do I get all the other supplies I need?” Well my friends, the answer is simple, this macrame superstore has everything you need including cord, giant plastic crochet hooks and even aluminum chair frames. Lastly, if any of you crazies attempt making your own cool chairs you gotta show me how they turned out, I’d love to see your results. Hope you enjoy this one! Update: New better macrame chair instructions over here. Holy smokes, these are beautiful!! These are incredible! I’m totally impressed…wow! I love your macrame chairs!!!!!!!!! Thanks so much for the tutorial! The Athens GA Fibercraft Guild is having a macrame class this year. I have never been very big on macrame but I think your chairs rather your Grandfather has changed that! Good Tip! I love this. I did happen to take a lighter and melt all the ends so they weren’t fraying but I was dreading weaving them in to hide them in the chair. It takes too long and I always want the project to be over by the time I get to that part. This makes it so easy! I will totally do this! 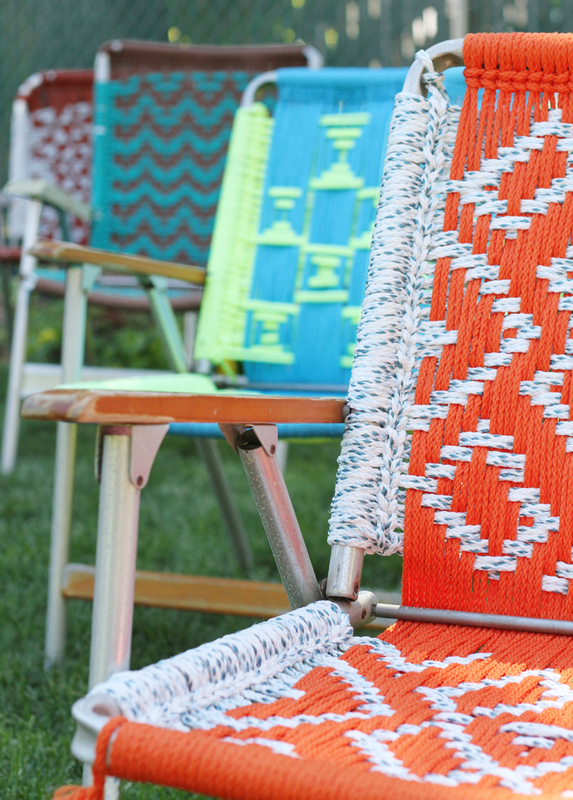 where can I buy the macrame cord and patterns for a lawn chair? Pick up a macrame tutorial book from ebay or etsy. They don’t make them anymore and this is probably the easiest place to find them. The macrame superstore has everything you need including cord, giant plastic crochet hooks and even aluminum chair frames. Good luck. I absolutely loved your tutorial. Thank you so much. I was having a hard time finding a neater way to attach the base strings to a swing I am making to hang off my four year old junior loft bed. I am crazy about the macramé chairs. They are so fun and comfortable. I have one I’ve been hanging onto forever and I’m hunting for other fun stuff to repurpose with the same method. I’m using a pretty solid rectangular frame that was missing the glass for the seat to my child’s swing. I hope it gives you a little inspiration. Awesome work. I hope you keep going. Macramé is unfortunately a dieting art. Yes, I’ve been thinking of other things I could do with it too. I think it would be so fun to macrame a bench or a side table. I’ll have my eyes peeled once garage sale season comes around. Sorry to hear the seat didn’t work out for you. That’s too bad. The instructions in the “Chair Macrame” books are so hard to understand and I tried to be as clear as I could in the video so others wouldn’t have the same trouble i did. The seat is really just like the back of the chair, but instead of working down the back you are working inwards towards the middle of the seat. The stitch is the same just moving in the other direction. I feel bad it didn’t work for you. Thanks! But I finally got it! It just took a little bit of time..You do such a awesome job..I appricate your help by video! Since they are taken to the soccer field to watch the grandkids team,It’s cool to do them in the team colors! Again,Thanks ! Linda. I know, it really is a tricky process, but I am glad to hear you got it. Sounds like a great thing to have for the kids soccer games! Love your video… just wish it was a bit slower. I’m planning on redoing a couple old lawn chairs, but it’s been years since I macrame’d one and can’t quite remember how to get it started. For that matter, if your technique is the one I used. Loved the video. I plan on replacing the seat of an old wooden rocker not real sure how you attached the first end of the cord. But am sure it will come to me. I know the video probably got a little “arty” but I figured someone could slow it down (pause it) and see the crucial steps if need be. I think you should be able to get it. Do you have any of the old macrame chair books? Their instructions are even worse, but I figure with the visual and the instructional books you should be able to figure it out. Good luck. PS I think I just attached the cord with a square knot. Loved the video! I have a huge swinging metal bench that I have needed a solution to and this is it! I will try’s end a photo when I get it done! We are attempting to make a macrame chair and we were wondering what pattern you used and is it possible to mail or e-mail it to us. We are in Canada. Nikki, I used an old out of print book, there are a lot of similar ones on ebay, follow the link! Cords-macramé style. I still placed a cushion on them to bring the seat up 2-3 inches. It definitely made a firm seat. I now can sit in them again without back pain. Thanks! Awesome! So glad you were able to use some of the info I provided. I know that video wasn’t the best ever, but I’m glad to hear you deciphered it! Noooo the superstore no longer is available. I have got to find that bright green cord! Who makes it? I think the superstore is still open, try this link. Is there a method to do just the seat of a lawnchair? Check out this post for more detail on the construction. I have been trying to find that soft, jelly like cording that used to be on all the lawn furniture to replace a wicker seat back. My first question, do you know where to find that or even what it’s actually called? The second is, if I can’t find that, I think the macramé would work for the backs, however, there is also a round wicker spot under the table (about halfway done the legs), do you have a recommendation on how to do that? Like, maybe a ring in the very center to work from? I love the tutorial-what is the music in the video? Hey Jackie, Sorry for the delay in reply – everything has been so busy ’round here with end-of-school-year-kid-stuff. The band is The Plastic Constellations (my husbands band from long ago). I loved the Plastic Constellations music but the music from your Vimeo tutorial sounds way different and still would like to know who the band is. THANKS! Hey, I love your chairs. I did some of these back in my younger days, but haven’t tried any in a while. 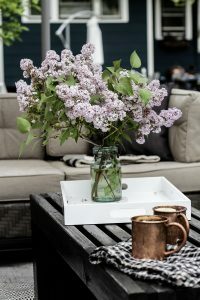 Do you have any suggestions on doing the same technique for a wicker porch swing? I have one that I would like to try, but so far I’ve been too intimidated. I love these. I’m going to try to make these in the near future. Random question, what’s the tattoo of on your arm? I love it! I am getting ready to do a macrame chair. I made the pattern myself, which is fairly detailed. I did not realize they were double corded. Is there a way to do it single corded? By this I mean instead of weaving two cords at a time you weave one. Is this possible? If not, will have to completely rework my pattern. HELP!! I am trying to make this chair. I will admit I’m not very familiar with crochet. I know this is macrame but the chain stitch is also crochet. Anyway, I have started this over and over and over. the cord does not stay under the chair. It gets wrapped around each end then it becomes a mess. What am I doing wrong!? I want to make this so bad. I am doing the bottom part of the chair and the back separately because of the style of chair I’m using. I don’t think that is the problem, though. Is it? Thanks so much for the video. I used to do these chairs about 30 years ago but had forgotten how. We had a nice set of heavy metal high lawn chairs that had worn out and couldn’t see throwing them out so still had some macrame cord and decided to try it again . Your video was so helpful. Thanks again. Hello do you sell the frames ? And do you ship to canada ??? 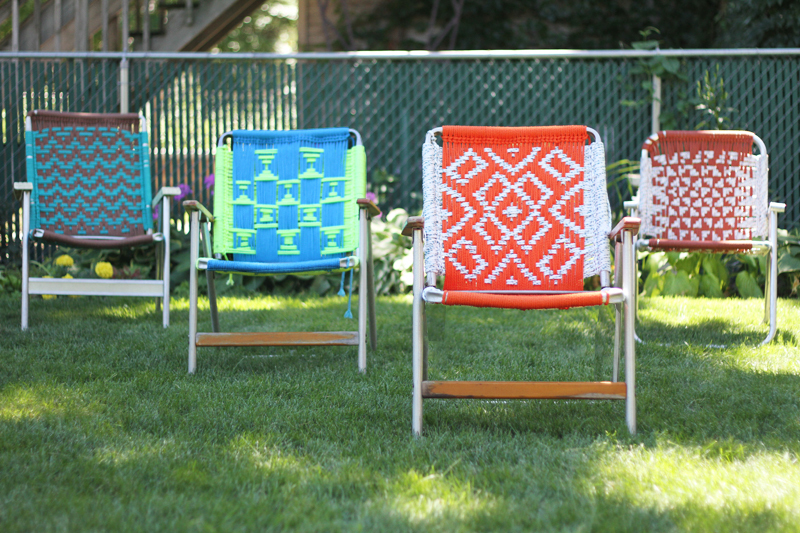 Lawn chair are loved by everyone.These lawn chairs are amazing.Thanks for sharing among us. Your patterns are incredible. Have you ever tried a wicker porch swing? I have removed all the old wicker and want to use macrame cord to redo the swing. Do you have any patterns or suggestions? a lot of it is popping it up all over the weeb without my agreement. Do you know anyy ways to help reduce content from being stolen? I’d definitely appreciate it. Thanks Scoops. Your tutorial was very helpful and your YouTube post too. Finished 2 chairs this summer. What a difference and a wonderful makeover.